One of the approaches ECHO is experimenting with in South Africa is that of intercropping moringa with legumes. 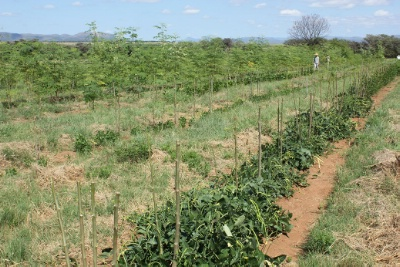 Moringa trees were planted in eleven 120-meter long rows. There are 3 meters of space between the rows. This (as of Feb 2013) is the second growing season that the trees have been in the ground. During the first growing season, we were simply trying to get the trees established. 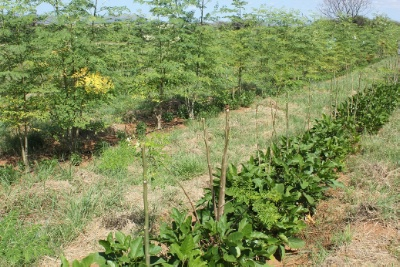 Now, in year two, after replacing trees that did not survive the first winter season, we have established plots with legumes planted at the base of the moringa trees. 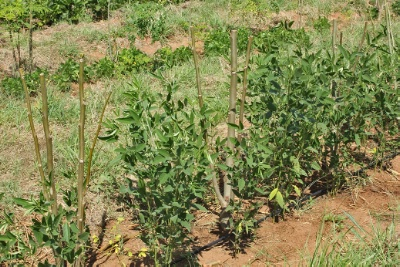 The moringa trees receive water as needed via drip irrigation. 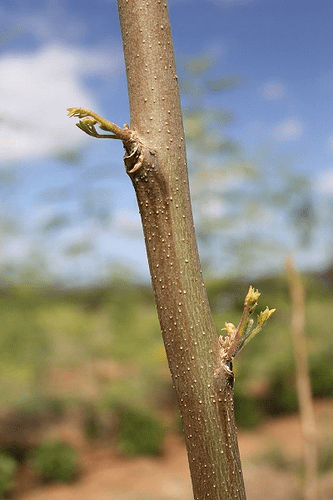 In later years, the moringa trees will need less and less water. There is an area about 1 m wide, at the base of each row of trees, that is kept free of grass and weeds. Within this zone, we are applying chicken manure; in year two, we applied it in three 5-t/ha applications over the season, for a total of 15 metric tonnes per hectare. We have done this to promote as much growth as possible so that the trees will develop thick, woody tissue that can withstand the winter season (we have had as many as 49 freeze events in a winter season; straw mulch is applied to the base of the trees to provide some protection against the cold). The remainder of the alleys is in native grasses which are mowed periodically; this minimizes the area that must be weeded. The moringa has grown substantially in year two. In comparison to year one, we’ve seen a four-fold increase so far in the dried leaf material harvested from the moringa plants. With the chicken manure incorporated into the soil at the base of the moringa trees, the legumes seem to also be doing well. Below are some photos taken during a mid-season pruning of the moringa trees in February. We pruned to a 1 meter height, leaving a few trees unpruned to produce seed. We will prune again at the end of the season before the first frost. We will measure the impact of legumes on moringa leaf powder production and mineral content. In future years, we plan to rotate legumes with a grain or possibly even a vegetable crop. A vegetable crop would make sense since it would be a higher value crop, which would make full use of the irrigation and manure applied under the rows of the trees. It remains to be seen how the canopy and root system of the moringa trees will develop, but we plan to maintain it as a hedge, which should preclude excessive shading.